“Be prepared to interrupt and insist on your right to be heard. This video is also found on their Facebook page https://www.facebook.com/plugins/video.php?href=https%3A%2F%2Fwww.facebook.com%2Findivisibleguide%2Fvideos%2F1472749059404352%2F&show_text=1&width=560“>here. Share with your friends and local media. Donald Trump’s video has great importance to Catholics in this election. Especially, since the Hillary Clinton campaign has mocked Catholics and set up false groups to infiltrate the Church to negatively influence Catholics as revealed in her staff’s emails. The next video shows the emails from the Clinton campaign that reveal an admission to creating groups to infiltrate the Catholic Church. This petition also brings up several additional important points that we highlighted in red. We are under attack by powerful organizations and politicians in the United States of America. Organizations and politicians who have distorted in public the true meanings of Marriage, Life and Freedom of Religion. Uphold and recodify in law, Marriage as the union of a man and a woman. Defend the Life of the unborn child from death and dismemberment, sale of his/her body parts, defend all persons from “legalized” euthanasia and rescue our Catholic, Orthodox, Protestant and Yazidi brothers and sisters from the horrors of ISIS. Uphold and recodify in law, the Free Exercise of Religion for their citizens. Defend the Poor from damaging policies based on “man-made climate change theory” that for a decade, have raised the costs on products from automobiles to food to washing machines. These policies have put more products and services even further out of reach of the Poor. These same policies also have made it more difficult or impossible for many who have a higher income to be charitable to the Poor. Your Holiness, our president and our politicians, (many of them dissenting Catholics on Marriage, Life and the Free Exercise of Religion) need to hear you on these moral issues. Catholics in the United States need and want to hear you and many non-Catholic Christians in the U.S. want to hear you on these issues. We pray you will address these issues and that this message finds you well and in good health. Be assured that you are in our prayers. Click HERE to sign the petition TODAY. Mary Landrieu’s ObamaCare Mistake Hurts Catholics and Louisianans. 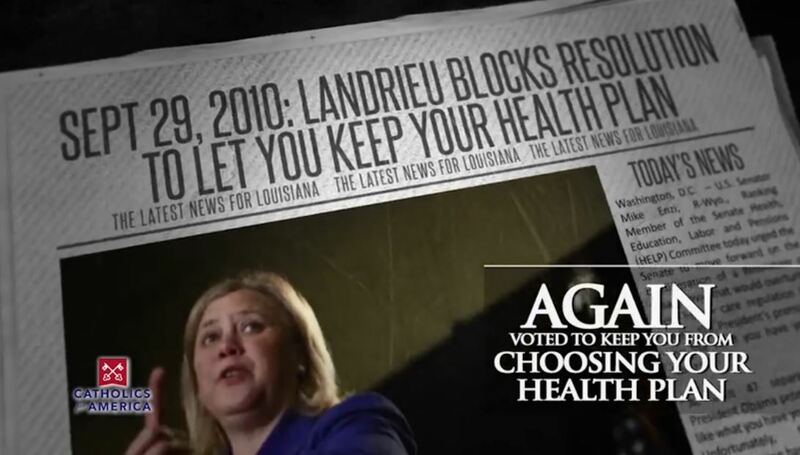 The ad factually states how Mary Landrieu voted for ObamaCare and that it took away health plans, that she voted to block a resolution that she knew would have let you keep your health plan if you liked it and then features an audio clip of Landrieu affirming her support of ObamaCare even after all of these things became widely known. The ad wraps up with a request to call Mary Landrieu and ask her to change her position on ObamaCare. 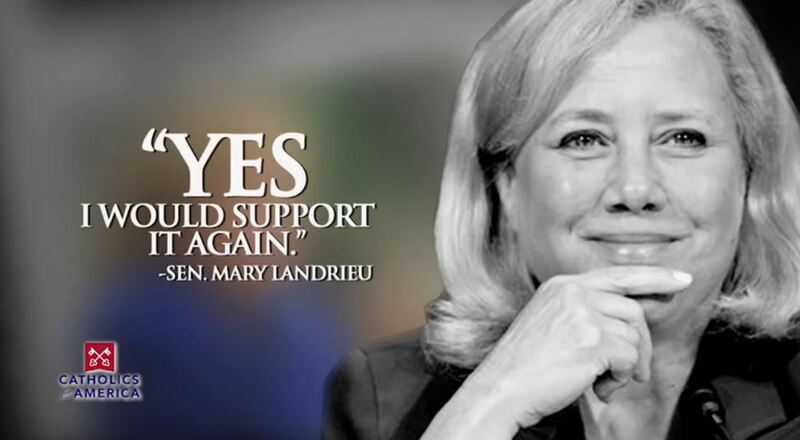 Though the ad’s intent is to engage people to get Senator Landrieu to change her position on ObamaCare, it proves how damaging Landrieu’s continued support of this bad law has been to millions in the United States. She certainly should lose her seat in the U.S. Senate for deliberately hurting so many people with this law. Below are three screen shots of the TV ad. The Video is at the bottom. Donate to Catholics for America HERE to see this ad on TV. The only way people will know about this ad is if you SHARE it on Facebook, Twitter, by email, YouTube, etc. Please get it out there. There are not any Catholic specific TV ads out there that we know of right now. It is our chance to defend the Faith. On June 30, 2014 the Supreme Court of the United States granted Hobby Lobby a 5-4 victory for Religious Freedom from the ObamaCare Law’s HHS Mandate. Later that day the 11th Circuit Court granted Catholic TV network, EWTN an injunction from the same HHS mandate. However, EWTN was one day away from being assessed fines of $35,000 per day on July 1, 2014. By this posting they would be fined $105,000 and one full year of fines would total $12,775,000 in fines! As we prepare to commemorate the signing of the Declaration of Independence and celebrate the founding of our nation on July 4th, we celebrate freedom! This restriction of individual freedoms is not just a history lesson, but a reality for American Catholics and others who object to the immoral and overreaching HHS Mandate. The HHS Mandate demands that contraceptives, sterilizations, and abortion-inducing drugs be provided for by all employers, including those who object to these life-denying practices. Though we celebrate liberty this July 4th, EWTN and many other organizations are in an on-going effort to fight for the freedom to act according to our consciences. On June 30, the U.S. Supreme Court ruled that Hobby Lobby and similar for-profit employers cannot be forced to comply with the federal contraception mandate against their religious beliefs. While we rejoice in this victory we know that the fight for EWTN and others goes on. We are also gratified that the 11th Circuit Court of Appeals in Atlanta granted EWTN an injunction preventing the federal government from enforcing the mandate against the Network while we pursue our appeal before the courts. What does this mean for EWTN? It means that — for the present — we will not be required to pay penalties, up to $35,000 per day, for refusing to comply with the HHS Mandate. This is not a total victory, as we still have not been granted an exemption, only temporary relief. It is, however, certainly a significant step in the right direction! As we stand for the rights of free citizens, protected by our constitution and endowed by our Creator, we must resist the indifference of the wider culture. We must be steadfast in prayer and hope! When we fight for freedom, we honor the many Americans who have served and died for the cause of liberty. First and foremost, we must pray regularly that God might bless our efforts and give each of us the courage to stand for truth in the public square. Second, we should not be afraid to speak openly about our opposition to the HHS Mandate. Third, we should invite others to stand with us. EWTN and others may be the target of this restriction of freedoms today, but a dangerous precedent is being set to arbitrarily limit the liberty of others. Finally, we can offer our support to the many individuals and organizations who are on the front lines of this debate, entrenched in court cases around the country. Let us recognize, as our founding fathers did, that the right to follow one’s conscience is a foundational principle of a nation free from despotism and tyranny and that these rights come not from the government of man but from the hand of a loving God! May God Bless You and our country! Thank you to EWTN for their courage. Posted in 2014, Peter L. Hodges Sr.
Fr. 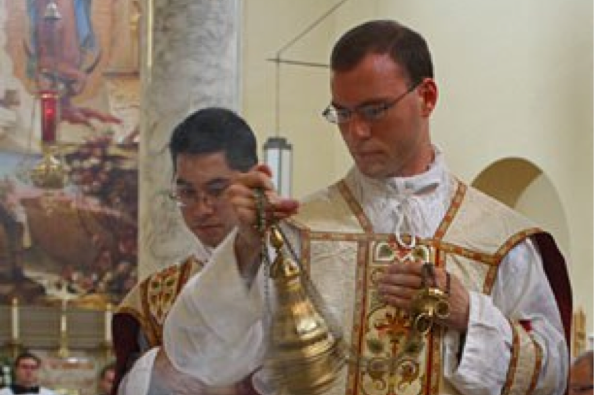 Kenneth Walker, FSSP, was murdered on June 11, 2014 at the Rectory of Mater Misericordiae Parish in Phoenix, Arizona, where he served as assistant priest. Fr. Joseph Terra was also critically injured in the assault. Fr. Walker comes from a large family. So, the travel expenses will be a great financial burden on them. Click HERE to make a contribution to Fr. Walker’s funeral expenses fund. We pray that God, the Creator and Redeemer will grant eternal rest to Fr. Walker, consolation to his family, consolation and recovery to Fr. Terra and consolation to the priests and parishioners of The Priestly Fraternity of St. Peter.